Here’s the second part of my attempt to deconstruct the dogma and search for the evidence supporting out current management of suspected spinal cord injuries n prehospital care. An aeromedical retrieval team attends a high speed road traffic crash in a rural area 250km from the nearest hospital. The only seriously injured patient has just been extricated from the car by local ambulance and rescue crews as they arrive. He is a man in his 20s with a GCS of 8 (M5), RR 20, SpO2 88% on NRBM, P 110, BP 100/60. He has obvious external chest injuries, an unstable pelvis and an obviously fractured right femur. The retrieval doctor decides to perform RSI before the >1 hour flight to hospital. There are no predictors of a difficult airway. RSI is performed with ketamine and suxamethonium. The front of the collar is undone and manual inline immobilization performed. On the first look the paramedic gets a grade 4 view. The second look by the doctor produces the same result. The Sats are now 73%. Should manual inline immobilization be removed in the hope of improving laryngeal exposure? The medico-legally correct answer, of course, is no. Manual in-line Stabilization (MILS, or MILI if you replace stabilization with immobilization) must be maintained at all costs once the collar is undone. Which is funny because I always thought A came before D (I’ve never accepted the concept of A-little c). So where is the evidence for MILS? As you’d expect there isn’t much. There is more than for prehospital spinal immobilization though. But there seems to be just as much evidence against as there is for. Manoach and Paladino did a great review of what literature there is in the Annals of Emergency Medicine in 2007. They couldn’t find any randomized studies, but found a bunch of case series, studies on volunteers (usually patients having GAs for unrelated matters) and studies on cadavers. The long and short of it is that they found a bit of evidence showing that MILS decreases cervical spine movement during laryngoscopy. This was mostly X-Ray or flouroscopic data. However, they also found just as many studies showing that laryngoscopy without MILS doesn’t cause a significant amount of cervical spine movement anyway and that MILS does little to prevent it. Sounds like equipoise to me. One study, in fact showed that the jaw thrust caused more c-spine movement than direct laryngoscopy! These were of course all small studies using surrogate end points. As I pointed out in the last post, we don’t really know if 2 degrees of neck extension during laryngoscopy will have any effect at all on an unstable spinal fracture. The authors of this study also point out that MILS can cause harm by worsening glottic view at laryngoscopy. This is well established and I don’t think anyone would doubt it. And this in fact may actually lead to increased cervical spine movement, as the increasingly panicked intubator pulls harder and harder on that handle. This well worded paragraph in Wall’s text highlights 2 important caveats – there must be no neurological findings to indicate a higher likelihood of cervical spine injury than in the average trauma patient, and the patient must be deteriorating with the current form of airway management. Whatever your own opinion of MILS may be and whatever the evidence (or lack thereof) may say, it is still standard of care, in particular if the patient has a confirmed or strongly suspected cervical spine injury. In fact the standard of care for these injuries is probably awake fibre/flexible optic intubation, but this is rarely appropriate in the emergency setting. What about videolaryngoscopes? They seem a pretty promising way to provide a better view without moving the neck too much. A 2008 crossover study on elective anaesthesia patients in Anesthesia and Analgesia showed that they do improve view, but don’t decrease neck movement compared with direct laryngoscopy. I wonder if improvements in technology will give us the solution. There is currently a cheap, portable flexible bronchoscope on the market. While I personally think it is somewhat hamstrung by its lack of a suction port, it wont be long before it has lots of friends. It seems logical that flexible-optic intubation via a supra-glottic airway (SGA) is the best solution to airway management in trauma, and hopefully it will be studied soon. What about transporting the patient with a SGA in situ. The so-called “rapid sequence airway”. This will undoubtedly work in a lot of patients. But what if they have pulmonary contusions and poor pulmonary compliance? Well ironically having a collar in situ may actually help the SGA to function in this setting by increasing the peak airway pressure required before a leak develops. Presumably the external compression of the neck soft tissues by the collar improves the fit of the GSA. 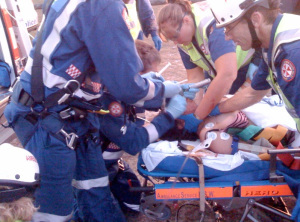 This has only been shown for the LMA supreme, a very popular SGA in prehospital care. Maybe this is the way to go, with or without intubation via a flexible scope? So, the scant amount of evidence is before you and the question remains, is it appropriate to remove MILS in order to improve laryngoscopic view? If you have a trauma patient who you can’t intubate and are in a situation where flexible-optic laryngoscopy is unavailable or unfeasible, what should you do? Should you fly the patient to hospital with a supraglottic airway (SGA) in situ? Should you perform a surgical airway in preference to removing MILS in the hope of getting a better view? I’m keen to use the lack of inhibitions provided by the anonymity of the internet to see what other would do in the scenario described at the start of this post. a colleague of mine recently had this exact dilemma and ended up transporting with LMA in situ. On the receiving end the consultant ignored MILS and successfully intubated! I think you can do either option and I know cause have seen it work on several occasions, both strategies. its interesting the concern about pulmonary injuries and adequate ventilation via a SGA/LMA. My colleague had the same issue.interesting post intubation ventilation did not improve much at all! I personally think RSA is a valid option in many prehospital and retrieval situations. that and primary surgical airway. we can sometimes try to be a bit too clever in securing the airway. I’d vote primary surgical airway. Preferably with some lidocaine with epi if available (which is probably unlikely in your retrieval example above) and some ketamine. Only caveat being that they are relatively average sized person. The average body habitus in the midwest US makes it harder for us to identify the anatomy in many patient so in that case standard RSI is probably best for definitive airway. I like Minh le cong’s last thought, just because we have fancier tools and can be clever doesn’t always mean we should. Failed DL in a collar with grade IV view on two attempts? Has your service used the Ascope/iGel combo in anger?